Before summertime gets too hot and hectic, we think now’s a great time to calm things down with an iTOVi tea party. It combines all the things we love most–finger foods, iTOVi scans, and cute lil’ teacups! So invite your girlfriends, watch highlights from the Royal Wedding for inspiration, and start taste testing to find the world’s yummiest scone. *Keep in mind that not all essential oils are safe for internal use! Be sure to check with your essential oil brand before consuming any oils. Don’t get too carried away with the tea, though! We all know guests really come to a tea party for the finger food. 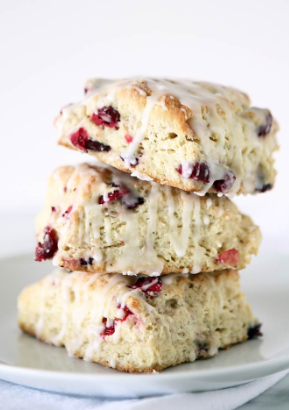 We’re drooling over these cranberry scones from The Kitchen Paper. Best part? This recipe calls for orange oil! Combine the flour, sugar, baking powder, baking soda, ginger, nutmeg, and salt. Whisk together. Using a pastry cutter, or two forks, cut the cold butter into the dry ingredients until no pieces are bigger than peas. In a separate bowl, whisk together the egg, buttermilk, and essential oil. Combine the wet and dry ingredients and mix until just coming together. Add the chopped cranberries, and fold in carefully. Turn the entire mixture out onto your floured counter and knead 4-5 times until it really comes together. If your dough is warm and sticky, shape it into a disc and wrap it in plastic wrap, and freeze for 10 minutes before continuing. Shape into a rectangle 1″ thick, and cut into 9 equal pieces. Arrange on a parchment-lined baking sheet and bake for 16-18 minutes, or until the tops are just turning golden. Combine all the ingredients for the icing and drizzle over cooled scones. Now that the snacks are all taken care of, it’s time to bust out the iTOVi scanner. While your guests are sippin’ on their tea, pass around the scanner and let them view their results. Also, be sure to lay out some of your own oils for guests to sample. If their scan report lists melaleuca oil, odds are they’ll be curious to try it! In the end, your guests really just want a chance to try out the products you love so much. The iTOVi nutrition scanner is there to give them a more interactive and exciting oil experience. 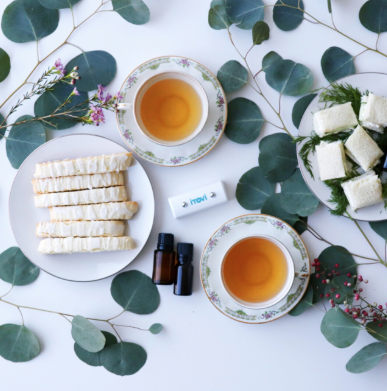 We hope you host a beautiful scanning tea party and share your pictures with us by tagging @itoviscanner. And remember, pinkies up! If you’re curious about our scanning parties, you can find more ideas here.